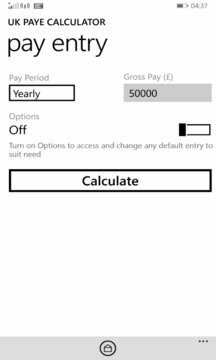 UK PAYE Calculator computes take-home pay/wage/salary/income for Pay As You Earn UK employees. It is simple and fun to use. Compute take-home pay/wage/salary/income on the go, and have it displayed periodically namely yearly, monthly, 4-weekly, 2-weekly, weekly, daily, hourly. 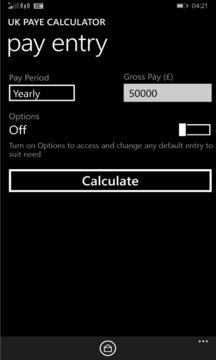 Choose a pay period, enter the gross pay for the chosen pay period (with the daily hours, weekly or monthly days and overtime hours, where applicable) and hit the calculate button. Other options include age band, tax codes, blind and married allowance, pension contribution, national insurance and student loan repayment plans.